British researchers are designing tools to help fit prosthetic (artificial) limbs to people, increasing their comfort. Accuracy of fit remains the single most important factor affecting amputee satisfaction. The quality of fit depends on how pressure is distributed around the limb and socket interface. There should be no pressure on the sensitive regions where the bone is close to the surface; all the pressure should be supported by the limb's areas of thick tissue. Until now, pressure data could only be collected by either: inserting a sensor into the socket/limb interface, which affects the results collected, or by modifying the socket to insert the pressure transducer, making it unsuitable for everyday use. The researchers from Bournemouth University, the University of the West of England and the Disablement Services Centre in Southmead Hospital, though, have found a third way without the drawbacks of the other two. They are using artificial intelligence to determine the pressures at the limb/prosthetic socket interface. Artificial neural networks (ANNs), like people, learn by example. An ANN is configured for a specific application through a repetitive learning process. To find the relationship between the surface strains and internal pressures, the artificial neural network requires a transducer that can reliably measure a strain response on the socket due to the internal pressure. The pressure and strain data must then be stored as ANN input and output pairs. This requires a loading device for applying known pressures inside the socket. The engineers decided to use strain measurement which produces reliable and repeatable responses. To do this they attached strain gauges to the socket surface, and had to choose carefully the best method. A transducer usually used for measuring strain underwater fitted the bill for the experiments. This is a resin encased stacked strain gauge rosette, giving three separate strain readings at 0, 45 and 90 degrees. The rosette is stuck to a plastic plate and the researchers used a standard hot glue gun to bond the transducer to the prosthetic socket via the plastic plate. They chose a Microlink 751-SG strain monitoring and control data acquisition system to capture the strain gauge data with a resolution of +/- 1 microstrain. 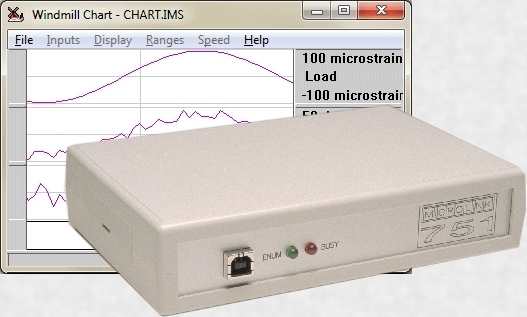 The 751-SG package comprises Windmill software, a USB unit which provides differential inputs to monitor 16 strain gauges at up to 80 samples per second, and a strain gauge connection box. The Windmill software automatically monitors the strain gauge's excitation voltage and performs a bridge calculation to produce a reading in microstrain. Eight USB units can be connected to one laptop to monitor up to 128 strain gauges. A portable system was required as the strain data was to be captured in a clinical environment. The Windmill USB unit was attached to a laptop. The researchers wrote their own software in Visual C++ utilising IML Tools' Active X controllers from Windmill Software, and ANN theory, to generate the code. The Scientists concluded that their methodology can aid "right first time" socket fitting which will benefit both the patient in terms of comfort and the prosthetist by reducing the time and associated costs of providing a high level of socket fit. The Microlink 751-SG package is currently on special offer, reduced from £775 to £475, and is available on-line at http://www.windmillsoft.com/daqshop/strain-measurement.html. For more information on this story or measuring strain, please get in touch. Ask our advice on your strain measurement application.